I figure this is must crash landing = stum bier = stumbier = be less wiry. Question: how does the direct definition have anything to do with the answer, if it is indeed the answer? Anyway, unless you live in Katherine, hi EC, I think it’s time for some answers. DA had the last laugh over me this week, I struggled in the Southwest corner. 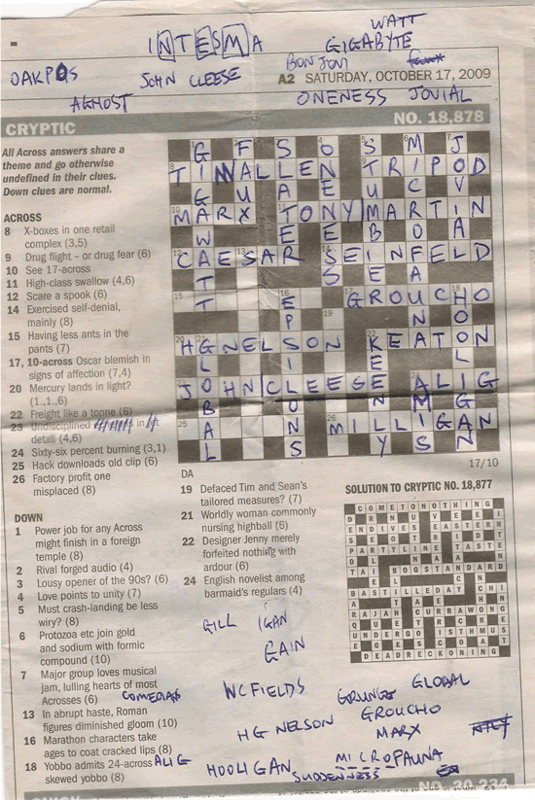 Can anyone tell me 15, 23, 25 and 26 across? And on the downs, I don’t have 1, 13 and 19. In the years to come, I’m gonna be telling my grandchildren about the good ol’ days when the climate wasn’t blisteringly hot, newspapers were released daily on paper and the DA was published in Friday’s Age. Perhaps I’ll also be telling my grandchildren about how good this week’s DA is. As what seems to be the case with most people, the SW corner was the killer in what was a very difficult DA. I was left with four blank which should have been two. Alas, I did not venture to write my answers down for the Roman figures and the measures clue without nary of an explanation. And am I alone in thinking he who is free of ants in his pants is not funny at all? The pick of the bunch: 2000 = mm = mid summer = midsummer = January. Brilliant direct clue: gave up nothing to beat = gave up nil drum = lindrum = felt champ. A combination of loves: cricket and sexual double-entendres: half-hearted quickie = Siddle – d = sidle = crab. An anagram of such innocuous letters, it took me too long to notice what was going on: sick of US in = fusion = alliance. Dirty DA once more: bounder in his cups = cad in a bra a bra = abracadabra = spell. Who’d have thunk there’d be two artists in a single anagram: Matisse and Dali abstracts = Matisse Dali abstracts = assimilated = took in. I just loved the two references to dance: devotee changed lead in dance = fan changed lead in tango = fandango = dance. A happy &lit clue: extreme gear for Nepal bluff = gr apnel = grapnel = extreme gear for Nepal bluff. Here, I’ve got average speed split count, we hear = par rate split matter, we hear = par ra matta = Parramatta = Eels. But does matter = count work in legal contexts? As in “on the matter of…” or “on the count of…”? Is that the match? Really? Karrie Webb’s home town? In Queensland, and a small one at that? This one made me bitter. Very bitter indeed. For the record: stay rudely cut = stay rudely cut = Ayr = Karrie Webb’s home. Clearly, Fairfax ain’t into Jung: DA continues to be Saturday’s Age cruciverbalist while I continue to assume he graces the SMH on Fridays. I’m doing better at today’s DS than I did last week’s, but it ain’t no DA, and has anyone else noticed the rather objectionable synonym for girl that is used in 22 across? 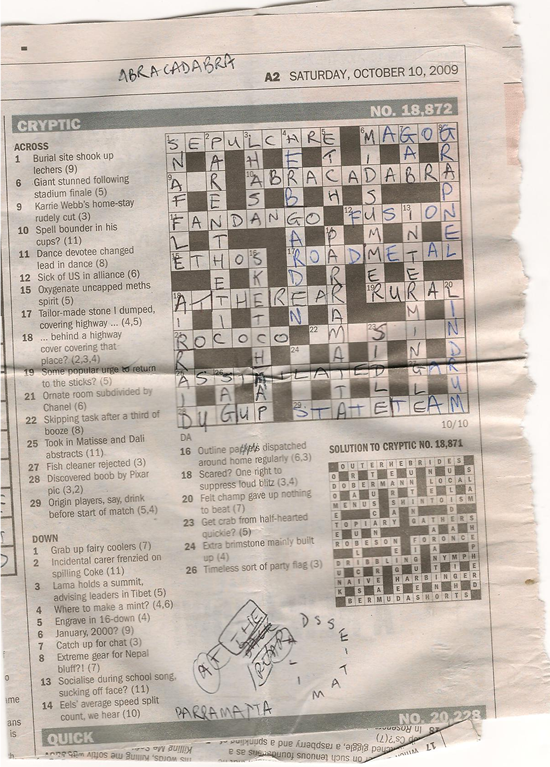 And on a sychronous note to this asynchronous DA, I had been racking my brain for a type of dance that could be the answer to 11-across before having a general read of the newspaper. I reached the climax of my newspaper-reading experience (I always leave the Opinion section to last), and the fugitive dance was found: this Shaun Carney article makes mention of a fandango!